To plunder, butcher, steal, these things they misname empire they make a desolation and they call it peace. 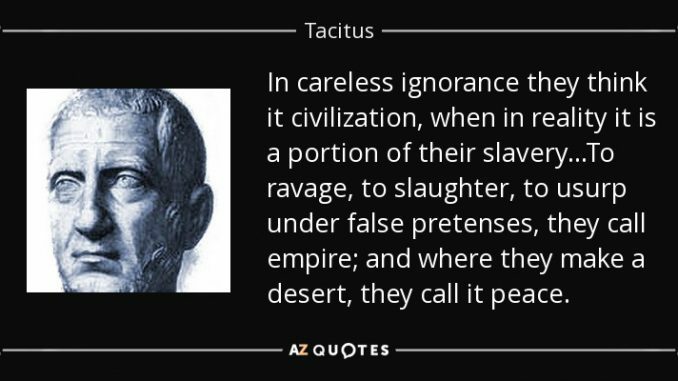 THESE WORDS were used by the Roman historian Tacitus to describe the devastation of Britain by the Roman empire in the first century AD. In a month Iraq has gone back centuries. The Americans came and promised everyone paradise, but where is it? This is hell. It is now more than a month since US-led forces liberated Iraq. Journalists in the country paint a picture of utter chaos and desperation. Armed gangs compete for bounty, shooting and stabbing their rivals, wrote Phil Reeves in the Independent newspaper. Gunfire has become as much a feature of occupied Baghdad as the piles of rotting rubbish that now cover the entire city. Paul Belden of the Asia Times described an angry demonstration of Iraqis outside the Palestine Hotel in Baghdad. Most of them were professionals unable to find work. There is no money! There is no job! said Salman, an unemployed electrical engineer. We are poor people, and we are running out of food! We need a new government! We need a free government! The US administration has done virtually nothing to restore essential services, meaning most people are without jobs, health care, electricity and clean water. People are being forced to drink contaminated water from the polluted Tigris and Euphrates rivers, leading to outbreaks of cholera and typhoid among children in Basra. The World Health Organisation warns that these outbreaks could rapidly become an epidemic unless health services are restored. Aid agencies are trying to provide assistance to Iraqis, with little help from the US military. They complain that their job has been made almost impossible by the failure of US and British forces to provide security. Some aid workers have disappeared. Others have had vehicles full of supplies hijacked by gangs. The US has gone some way towards recognising the extent of the disaster by sacking its administrator, retired general Jay Garner, and replacing him with a civilian, Paul Bremer. But its an incredibly cynical switch. Bremer is well liked by the dominant conservatives in Washington for his hawkish attitude to Syria and Iran. He is an expert on counter terrorism and a former managing director of Kissinger Associates, the company of notorious war criminal and former secretary of state Henry Kissinger. Bremer and other senior US officials are holding meetings with opposition groups, with the aim of setting up a government totally compliant with American interests. Ordinary Iraqis are furious with Garner and Bremer for appointing senior figures from Saddam Husseins Baath Party to top government jobs. WE ARE not here as a colonial power, said new US administrator Paul Bremer on arrival in Baghdad. We are here to turn over power to the Iraqi people as quickly as possible. But the USs real intentions are spelled out in the resolution it is submitting to the United Nations. This resolution acknowledges that the US and Britain are occupying powers. It awards them near total control of Iraqs oil supplies. It also aims to abolish the oil-for-food program within four monthsa program 60 per cent of Iraqis rely upon for subsidised food rations. And as the US moves to establish an interim Iraqi government, it is becoming clear where the real power will lie. US advisers will be part of every Iraqi ministry. Their job will be to turn Iraq into a model capitalist economy. Two officials from the US treasury department have been appointed to reorganise Iraqs financial systemto bring it into line with IMF and World Bank neo-liberal doctrines. Chief adviser to the oil ministry will be Philip Carroll, the former head of Shells US division. Oil analyst Michael Renner of the Worldwatch Institute said these appointments showed the real agenda in Iraq was not empowering Iraqis. Theres no shortage of Iraqis who know how to run the oil industry, so why exactly do you need someone like Carroll? Renner said in an interview. Its likely that Iraqi oil is headed toward de facto privatisationa scheme that puts real control in the hands of the oil multinationals. The reorganisation of Iraqs economy is just the first step towards remaking the Middle East in Americas own image. In a recent speech at the University of Southern California, George Bush announced plans to create a free trade zone in the Middle East. He is sending secretary of state Colin Powell and trade minister Robert Zoellick to the Middle East in June to attend an exclusive conference organised by the World Economic Forum. The conference, themed visions for a shared future, will bring together 1900 political and corporate elites, to discuss new opportunities for trade and investment. It will be chaired by the CEOs of multinationals Boeing and Nestle. They want to come here and talk about doing business when the blood of Iraqi civilians hasnt yet dried and the people of the region are very angry, said Wael Khalil of the Anti-Globalisation Egyptian Group. King Abdullah of Jordan is hosting the event. He is one of Washingtons closest allies in the Middle East and has already signed a free trade agreement with the US. Having implanted itself in the region militarily, the US is clearing the way for a second wave invasionthis time by American companies. POPULAR ANGER towards the US occupation is growing on a daily basis. And there are signs it is beginning to take a more organised form. Eighty thousand people turned out at a rally in Basra to mark the return of Ayatollah Mohammed Baqir al-Hakim, the leader of the Supreme Council for the Islamic Revolution in Iraq (SCIRI). Hakim has been living in exile in Iran for 23 years and has a significant following among Iraqs Shia Muslims, who make up about 60 per cent of the population. Hakim called for US troops to leave the country as quickly as possible. When we want to move, we find foreign troops. It limits our movement toward reaching our goals, he said. There are also reports of workers staging demonstrations, mostly in the Kurdish areas of northern Iraq. Hundreds of teachers in Arbil demonstrated recently, demanding payment of wages and the right to form a union. Workers in the North Oil Company in Kirkuk have met to discuss forming a union. Several thousand people rallied in Kirkuk to mark May Day. Communist parties, which were persecuted and driven into exile by Saddam Hussein, have set up offices throughout the country.